Boasting 2.5 kilometres of private beach, the luxurious Hilton Fiji Beach Resort offers spacious rooms with floor-to-ceiling windows. It features a day spa and 9 swimming pools, including 2 adults only pools in the Koro complex. Free WiFi is available in public areas around the property. Hilton Fiji Beach Resort & Spa is located 12 minutes’ drive from Nadi Town and 3 minutes' drive from the Denarau Golf and Racquet Club. Nadi International Airport is a 20-minute drive away. Opened on June 26, 2017 at Hilton Fiji Beach Resort and Spa, KORO is an adult only zone that includes beachfront restaurants with all day dining, a bar, expansive outdoor pools and a deck. There is live entertainment offered every night and there is a day spa and fitness centre, located alongside the KORO complex. 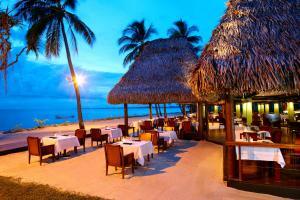 All the rooms at the Hilton Fiji Resort are luxuriously appointed, with flat-screen cable TV and DVD players. 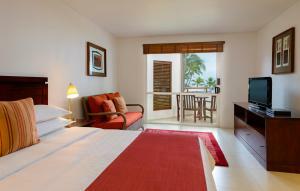 Each room is air-conditioned, and most also feature gorgeous ocean views. Guests can work out in the fully equipped fitness centre. Nearby activities include fishing, jet skiing and diving. Children receive free access to the kids club. Union Pay credit cards are accepted and there are Chinese speaking staff at the property. Nuku offers Fijian specialities and international cuisine, while Maravu features Pan-Asian cuisine and stunning water views. The Deli serves a range of espresso coffees, pastries and gelato. The adults only Koro offers breakfast, lunch and dinner. Boasting an infinity pool and landscaped gardens, Sheraton Denarau Villas is situated just 1.2 miles from Denarau Marina. Free WiFi is available. Sheraton Denarau Villas is part of a 5 star resort complex and guests have access to shared facilities at The Westin Denarau Island Resort and Spa and Sheraton Fiji Resort, including 14 dining venues, 6 swimming pools, a spa, fitness studio, golf course, kids club and more. Guests can enjoy both motorised and free hire of non-motorised water sports equipment. 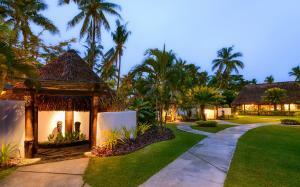 Each beautifully styled villa is designed to reflect the idyllic lifestyle of Pacific Islands. All villas have laundry facilities, a dining setting and a fully equipped kitchen with a stovetop, refrigerator and dishwasher. Slippers and a complimentary dental kit are providedThe property has a gym and a swim-up bar. Guests enjoy direct beach access and 24-hour room service. Denarau Villas Sheraton is adjacent to Denarau Golf & Racquet Club. 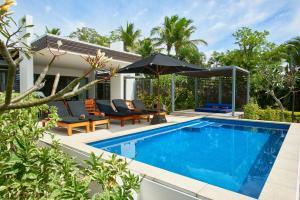 It is 4.3 miles from Nadi town and a 20-minute drive from Nadi International Airport. 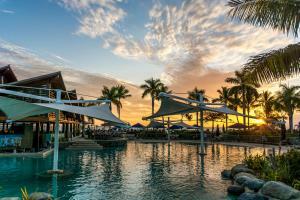 Radisson Blu Resort Fiji is spread across 10 acres of pristine beachfront on Denarau Island and is surrounded by climate controlled lagoon style swimming pools, lush gardens and bordered by the Denarau 18 hole golf course. Nadi International Airport is 25 minutes' drive from the Resort. 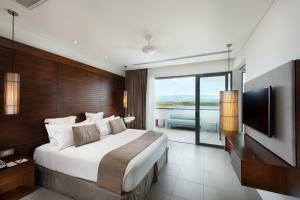 All 270 rooms at Radisson Blu Resort Fiji have private balconies or courtyards with modern furnishings. The suites boast a full kitchen, separate lounge and dining area as well as laundry facilities. 1-bedroom, 2-bedroom suites and guest rooms are available. 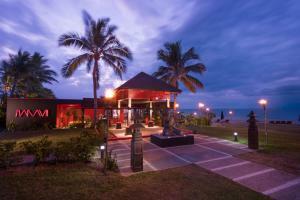 Radisson Blu Fiji boasts four diverse restaurants as well as two specialty dining restaurants. One of the lagoon style swimming pools is adults only and there is a kids pool with a white water tunnel slide. For your children's entertainment there is the Blu Bananas kids club offering a range of activities. Guests enjoy free WiFi throughout the resort. Other resort features include the Harmony Retreat Day Spa, Evolution Fiji water sports, fitness centre, Lai Lai Mini Mart including a bottle shop and Lobby Shop. Private car transfers are available to and from Nadi International Airport. These are charged FJD 45 each way. Please inform Radisson Blu Resort Fiji in advance if you want to use this service, using the contact details found on the booking confirmation. 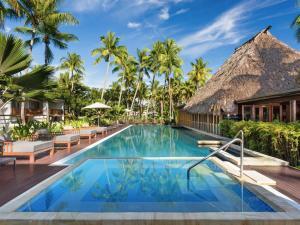 Enjoying a stunning beachfront location, Sofitel Fiji Resort & So Spa offers an exclusive island retreat. Guests have access to a large lagoon-style pool, day spa and 3 restaurants. Some rooms include free entry to the adults only Waitui Beach Club. Guests enjoy free WiFi in the rooms. 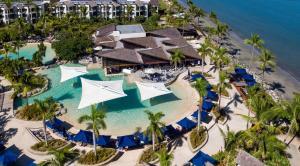 Sofitel Resort Fiji Resort & Spa features 296 modern rooms, each with a private balcony overlooking the ocean. All are air-conditioned and include an LED TV, minibar and personal electronic safe. Most rooms have ocean views. All rooms have slippers and complimentary toothbrush and toothpaste. Guests can try water sports activities such as snorkelling, or work out in the fully equipped fitness centre. Sofitel Fiji Resort & So Spa is located next to the 18-hole Denarau Golf Club. So Spa offers private spa treatments with an air-conditioned massage pavilion, open-air shower and outdoor spa pool. Enjoy a candlelight dinner overlooking Nadi Bay or order in room service. With 4 bars to choose from, evenings can be spent sipping cocktails in the moonlight. Westin Denarau Island Resort & Spa, Fiji is an integrated resort complex with 6 swimming pools, 14 dining options, an 18-hole golf course and 10 tennis courts. This luxurious property enjoys a beachfront location at Denarau Island and is a 10-minute drive from Nadi Town. Free WiFi is available. All guest rooms include air conditioning, tea/coffee making facilities and flat-screen satellite TV. The en suite bathroom comes with free toiletries and a hairdryer. Slippers and a complimentary dental kit are provided. Guests can enjoy both motorised and non-motorised water sports equipment available on hire. You can access the beach directly. There is also a day spa, a fitness centre and a hot tub. Guests also have access to Denarau Gold & Racquet Club as well as use of the Bula Bus service. 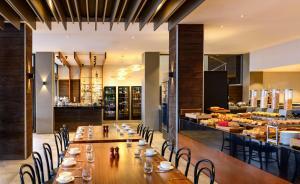 Guests are spoilt for choice with a variety of restaurants/cafes to choose from at the property. The Kitchen Grill is located at the beachfront and poolside and is beautifully designed to reflect the Fijian culture with the warm and relaxing ambience of the South Pacific. The contemporary grill menu boasts local produce and share plates. The Ocean Terrace offers the Westin buffet breakfast enriched with SuperFoodsRX™. Look out over the Nadi Bay and indulge in the selection of hot breakfast items, including a live cooking station where one of the Resort's Chefs can prepare eggs to your liking. Zing restaurant features a variety of fresh produce and ingredients and offers a fusion of Chinese and Indian influences, while The Westin Bakery offers light snacks, wraps, pastries and coffee/tea throughout the day. Enjoy a relaxed dining experience or just pop in for a cocktail amid beautiful ocean views and sunsets in our beach-side location at The Westin Denarau Island Resort & Spa. Our Meke Lovo Cultural show nights, taking place every Wednesday and Saturday, are always a sell out, so be sure to book your seat well in advance. Guests will witness the mystic gift of walking barefoot on hot rocks, followed by a lovo cooking styled feast. Guests staying at The Westin Denarau Island Resort & Spa, Fiji, have access to all facilities at the sister properties Sheraton Fiji Resort and Sheraton Denarau Villas. Fiji Westin Denarau Island Resort & Spa is a 3-minute drive from Port Denarau Marina and a 20-minute drive from Nadi International Airport. Sheraton Fiji Resort boasts a waterfront location just 3 minutes’ drive from Port Denarau Marina. It offers an outdoor pool, direct beach access and a day spa. 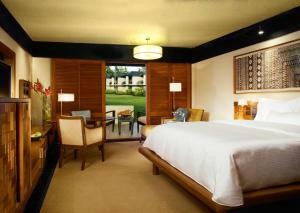 The guest rooms are beautifully furnished to create an idyllic South Pacific setting. All rooms include air conditioning, tea/coffee making facilities and flat-screen cable TV. Slippers and a complimentary dental kit are provided. You can pamper yourself at the day spa or work out at the fitness room. There is also a swim-up bar, a tennis court and water sports facilities. Sheraton Fiji Resort is part of a 5 star resort complex and guests have access to shared facilities at The Westin Denarau Island Resort and Spa and Sheraton Denarau Villas, including 14 dining venues, 6 swimming pools, a spa, fitness studio, golf course, kids club and more. Guests can enjoy both motorised and free hire of non-motorised water sports equipment. 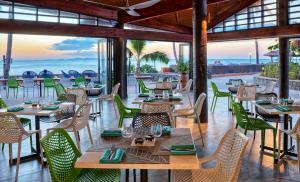 Flying Fish Restaurant Fiji by Celebrity Chef Peter Kuruvita serves a selection of fresh seafood and seasonal delights. Head over to Feast Restaurant to enjoy buffet-style meals while enjoying the views of the resort’s pool. Chime Lounge and Bar features a charismatic lounge-style setting with a spacious dance floor and daily live entertainment. The buffet breakfast includes Chinese options. There are Chinese-speaking staff at the property, and airport transfers with Chinese-speaking staff can be arranged upon request. 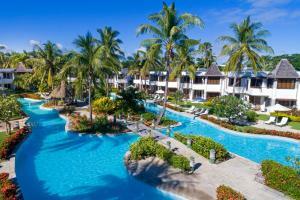 Fiji Resort Sheraton is 4.3 miles from Nadi Town and a 20-minute drive from Nadi International Airport. It is 15.5 miles from Garden of the Sleeping Giant.